Easy Vegetable Stir Fry with Creamy Peanut Sauce | Delish! There are some recipes that we get really excited about. If you’ve been following us for a while now you might just remember this immense Peanut Butter Salad. It was one of our very first recipes, and we were very proud. To date, it’s also the only video that Howie, Dave, Kat and even little Josh have all appeared in together. The sauce is absolutely amazing, and we’ve been looking for excuses to use it again ever since. And we’re very happy to say we’ve found one. It’s this beautiful vegetable stir fry. The veg is up to you really (we’ve highlighted some great choices in the recipe below), but it’s all about the sauce. As is often the way, the sum is greater than the parts – namely peanut butter, soy sauce, sweet chili sauce, ginger, garlic and maple syrup. An unbelievably tasty combo. Fresh veg is best. If you use frozen to speed things up (like in this recipe) help yourself out by making sure it’s thawed – just leave it out the freezer for a couple of hours or use a microwave. An oil with a high smoke point works best. 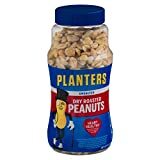 Peanut oil is a great choice. You can use others in a pinch but you’ll get much better results this way. In a similar vein, stick to two servings max. per pan/wok, otherwise it’ll get too crowded in there. If you’ve never made a stir fry before you probably won’t get this done in 25 minutes. The second time you make one, it’ll be a whole different story. You might even be able to pull this one off in 20 minutes with a bit of practice! Stir-frying is an ancient craft where people tend to get a bit hot under the collar if you don’t follow the rules. The directions below are beginner friendly, so don’t give me heat (ok I’ll stop now), if you think I’m not following the 18th century Chinese wok tradition step by step, ok? Check out my favourite Asian Chef Jamie Oliver to see how to make a stir fry if you have no clue at all (and then scroll to the comments to see how much hate he gets for his version, lol). Ah, by the way: Jamie uses meat! If you want to see a how-to that only includes veg, click here. 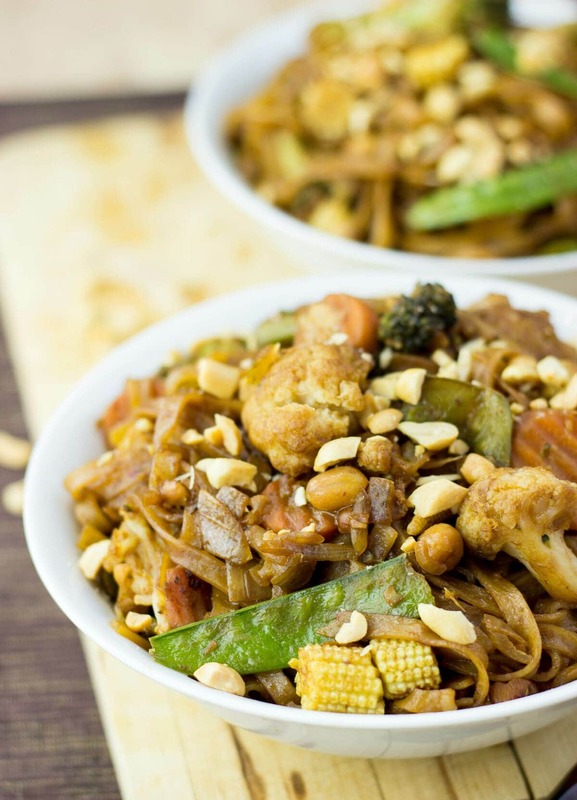 A delicious peanut sauce compliments this fantastic stir fry with simple to follow cooking tips. Beginner friendly and super quick to make! Get all ingredients ready and in one place. Thaw the frozen veggies (with a microwave or by taking them out of the freezer early enough). Chopping time: chop the snow peas, baby corn and onion. Dice the garlic and ginger. For the sauce: grab a large bowl and chuck in the peanut butter, soy sauce, sweet chilli sauce, water, syrup. Mix well with a spoon ‘til it’s a nice and creamy sauce. Optionally, throw in the lemon grass. Cook the noodles so you have them at hand when the stir-fry comes together. When ready, drain and rinse under cold water (they’ll stick together less). In a wok or large pan heat the oil until it starts smoking. Around 40 seconds later add the thawed veggies. (If you just use fresh veg, throw in everything at once). Stir it well for about 4-5 minutes. Reduce the heat a little and add the sauce and noodles. It’ll quickly begin to boil. Make sure it’s all nice and creamy. Add a little more water, if not! Let it simmer for another 3-5 minutes. 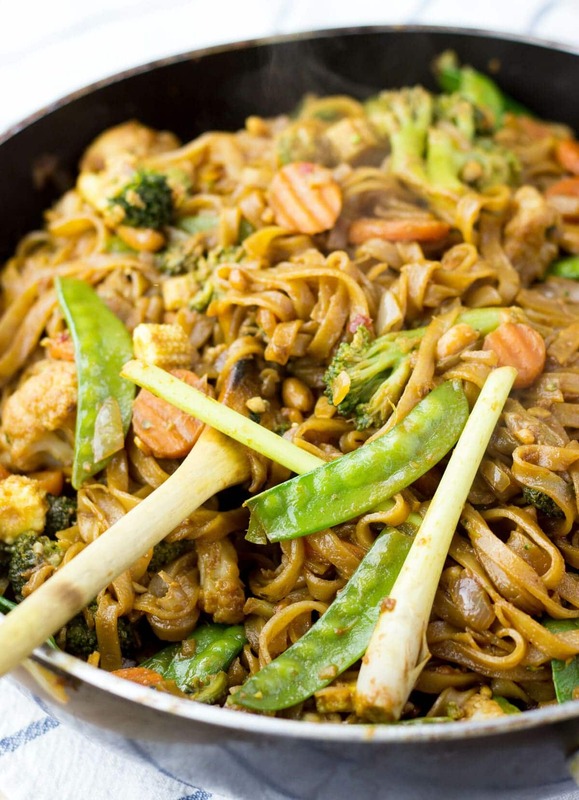 IF YOU LIKED THIS RECIPE: You need to check out our delish Fake Lo Mein. Also make sure to try this Pasta Salad with an Exquisite Peanut Sauce, if you like this Asian kind of touch! PS. The nutritional info here is using store-bought peanut butter. You can make a much lower sugar (and cheaper!) 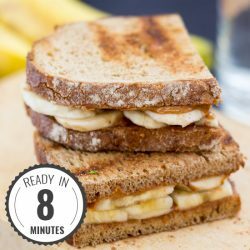 version of peanut butter yourself in just a couple of minutes. 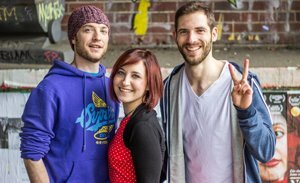 It’s well worth checking out. yummy, I love baby corn and snow peas! I’m sure that peanut sauce is amazing too! Thanks Beverley 🙂 Yeeeahhh get that extra protein in there! You just made me realise I haven’t made my egg muffins for lunch after the gym tomorrow…cheers! Stir Fries are seriously the best. So easy, so tasty… My wok is one of my best friends lol! I tried this recipe last night.. Wow! I’ll admit I was a little unsure how it would come out and thought the sauce might not be the right consistency but I was proven very wrong 🙂 loved it, definitely recommend and will be making this again. Thanks! Hey Jake! Thanks a lot for the positive feedback!! Awesome that it turned out great. I love stir fries. Have to try your recipe. Perfect, because I’m trying to make more dinners without meat. Perfect stir-fry! Simple yet deliciously tempting. Gotta make it!!! Wow, so beautiful! Love all those delicious veggies you got thrown in there! I make peanut sauce so much and I feel like I could drink it, I love the Asian flavors so much, we must eat it 3 times every week, haha! Great recipe and I love how pretty your pics look! This is making me hungry for stir fry and it’s only 10 am! What a gorgeous recipe. This sounds fabulous! 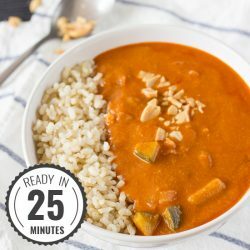 I make a similar peanut sauce served over vegetables and tofu. It is one of my favorite comfort foods! I loooove a good stir fry and my favorite ingredient is definitely baby corn! This peanut sauce sounds divine – I just recently made a stir fry with soy sauce, ginger, garlic and oyster sauce. SO good and SO quick! This looks so delish!! I love a good stir fry. Such an easy and great recipe to throw together! I love the peanut butter and the sweet chili sauce (yerrr!!) and that you can use frozen veg. I’ll be trying this, sounds quick and yum! I am on the lunch break of an Engine 2 / 2 Forks retreat, and we just finished a cooking demo with Chef Del Sroufe – he made a stir fry that was DELICIOUS. I love this version with peanut sauce – I love peanut sauce on pretty much anything! This sounds delicious, I love the fusion of flavours you have working in that peanut sauce it sounds fabulous! This looks insanely delicious — and 25 mins?! Awesome. I don’t know why, but seeing baby corn in stir-fries always makes me happy and hungry 🙂 Beautiful photos! Yum! 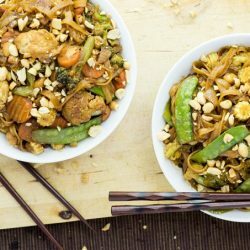 I love peanut stir fry, and this one looks delicious! And I love how simple it is to make~! Oh man, I haven’t pulled my wok out in far too long!! I’l have to remedy that and make this ASAP! I’m drooling over that peanut sauce! Pinned!! 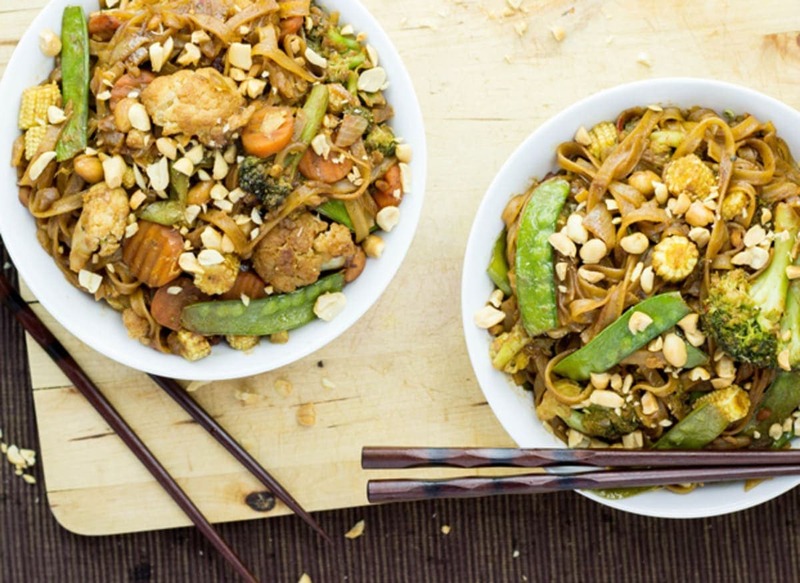 I love a great stir-fry especially when it involves a peanut-based sauce! I used red and white quinoa instead of noodles and it was divine. That’s a very cool idea Daniel! I’m on a bit of quinoa trip recently (after discovering it’s a complete protein), so the next time I make it I’ll give it a bash that way. Cheers! I want to mention that I found the instructions a bit too verbose. Things like “A wok doesn’t have to be expensive” and “Ok, let’s fry this mother.” don’t need to be in the recipe. Recipes should be concise. Extra comments like that should remain in the blog post. Otherwise, it brings down the quality of the written recipe. I’m sure you’re a very qualified cook. When you search for recipes online, how would you feel if every recipe you read was included with extraneous info that you didn’t ask for, and that you already knew? I’ll demonstrate with a few absurd examples: Ex. Step 2: Brown the beef. Browning comes from the maillard reaction, and this imparts umami flavor. Umami is often regarded as the 5th taste. or Step 3: Drain the beans. You don’t want to cook with bean water because it often contains leached BPA from can linings, and the liquid contains abundant starches that will affect the consistency and taste of your final dish, in addition to potentially contributing to flatulence. Wouldn’t that be tiring if you read these sorts of things you already knew in recipes you saw? Even after scrolling past the blog post to get directly to the recipe so you could evaluate it? Also: I’m not sure if you’re aiming mostly for an adult crowd with your blog/recipes, but if you also want to include families in your target audience, shortened versions of words inappropriate for children should probably also not be put in there for people who are cooking with children, and having the child read the recipe. Thanks for your feedback, although I find it a bit too verbose. Don’t water down/dumb down what you are doing. If you try to be everything for everyone you will be nothing for no one. Writing so your personality shows through is harder than writing a boring instructional recipe. Keep being you. Your audience loves you for it! I must disagree with you! I love the witty banter in the recipe, I love that she speaks as a human and not a teacher. I keep coming back to this website because of it’s lighthearted nature as I am sure do many others. What I did found a bit too verbose was your unnecessarily lengthy comment… you sure do have a lot of time on your hands. And even cooler to hear you like the recipe. Thanks for commenting! I think the commentary make cooking less boring! 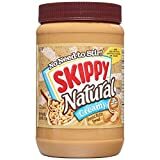 Would you recommend natural peanut butter or just a store bought spread like kraft pb? Ah, thanks for getting back, nice to hear that! Left over stir fry makes a great quick soup! With a quick blend – cool idea!! Best stir fry sauce ever. I use this every single time I make a stir fry as it is just absolutely epic. If I don’t have sugar snap peas or baby corn I just whack everything I’ve got in. I use soya chunks or tofu and marinade them in the sauce and add cashew instead of peanuts to get even more variety of healthy fats in. I would highly recommend putting the lemongrass in as it totally makes this this recipe a 10/10 for me. I could literally live off this stir fry recipe for the rest of my life and not get bored. I always look forward to make a stir fry and it is the easiest thing in the world to make. I would take this on a desert island. Well that’s me ‘fangirl-ing’. Thanks for this awesome recipe that is used time and time again. I’m not sure if we ever had anyone ‘fangirl-ing’ before – we’ve gone red now! Thank you for the compliments, Unity. Really glad you like the sauce, and your marinaded soya chunks sound awesome! Great idea, I’ll try it like that myself now! This peanut sauce is seriously, restaurant quality. I’m never getting a peanut satay-take away again!